CAIRO, Egypt (CNN) -- There's more to wearing the "niqab" -- the austere, all-covering veil favored by ultra-religious Muslim women -- than meets the eye. Cairo University students wearing niqab stand outside a university dormitory on Oct. 7 unable to enter due to the new rules preventing admission to niqab wearers. A recent declaration by a leading Egyptian cleric that women will not be allowed to wear the niqab in university areas frequented only by women has sparked demonstrations by female students in Cairo determined to wear the all-encompassing veil wherever they go. Egypt's Al-Azhar university, the highest seat of Sunni Islam, recently convened an all-male committee to rule on what women can wear at Egypt's public universities. Even though that was a step down from a statement he made earlier that the niqab would be banned in all public universities, his ruling sparked controversy with the growing number of women in the country who choose to stay covered. The initiative from Al-Azhar is seen by many in Egypt as an attempt to counter the growing appeal of the strictest interpretations of Islam. An increasing number of young women in Egypt are turning to the niqab. The niqab is worn by many Muslim women throughout the Arab world and beyond and is most common in the countries of Saudi Arabia, Yemen, Bahrain, Kuwait, Qatar, Oman and the United Arab Emirates. It is also commonly worn in Pakistan. 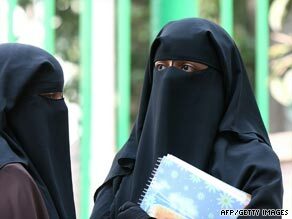 "The niqab should be worn under two circumstances," a cleaning lady who works at Al-Azhar, told CNN recently. "A very beautiful woman should wear it to prevent men from fighting over her, and an ugly woman should wear it to hide her face." There is no consensus among Muslim scholars regarding the wearing of the niqab, the piece of cloth that covers a Muslim woman's face. Women who wear it usually also cover their hands. It is widely believed to be a tradition that comes from the Arabian peninsula, introduced to more liberal countries like Egypt by people who have lived and worked in ultra-conservative countries like Saudi Arabia. There's not much about it in the Koran, Muslim's holy book. The Koranic verse that applies to female head covering translates loosely as: "O Prophet! Tell your wives and your daughters and the women of the believers to draw their cloaks all over their bodies." And so consequently, there are plenty of interpretations. And all sorts of opinions in the Egyptian parliament. The opposition-led Muslim Brotherhood opposes the niqab ban. "It's unacceptable that the niqab is treated as something bad that needs to be suppressed," Brotherhood member of parliament Muhamed Baltagi told CNN. "It's unacceptable to violate private matters in this way." In Baltagi's opinion, it's a matter of personal choice and should not be dictated by the shaikh of Al-Azhar. Appointed by the president of Egypt, the shaikh of Al-Azhar is viewed as little more than an appendage of the authoritarian Egyptian government, and thus scorned as a state puppet by both religious and secular critics of the regime. Since the 1960s the shaikh of Al-Azhar has been appointed by the Egyptian president. In Europe, wearing the niqab has become a controversial issue too. Recently, French President Nicolas Sarkozy banned it from French classrooms. And British Justice Minister Jack Straw also recently asked women to remove them in his consituency office. In Cairo's main shopping district, the message on the niqab is decidedly mixed. The few niqabs on display are vastly outnumbered by far more risque outfits, including no shortage of mannequins sporting evening dressings with plunging necklines and naked arms. There are a few niqabs on display, but lots of less conservative clothing is on the shelves too. Outside Cairo University, some women go without any head covering at all. Most wear headscarves -- usually quite colorful ones. Those who choose to wear the niqab say the religious scholars should have asked a woman what she thought of the ban first. "He should have taken at least one woman's opinion," said student Muna Abdel Fatah. "Because the decision will impact on her." Daniela Deane contributed to this story.